UPDATE: it appears that this offer has reappeared again (June 2016) but it's only targetted to certain cardholders. Currently Virgin Trains (both East and West Coast) are offering triple Nectar points on train tickets booked online, they've already tried before with a double points offer that failed to impress so they're trying again. Is this offer good enough to seriously reward loyalty? The answer is still no. If your tickets qualify it just means the points you earn are worth 3% of your ticket price rather than 1% it's still exceedingly poor compared to East Coast Rewards. Unless you're spending a lot on your travel you're unlikely to earn enough to really make a difference. For example if you spend £255 before the deadline of 30 November 2015 you will get £7.65 worth or points rather than £2.55 but with East Coast Rewards the same spend would have got you a free Standard Class ticket anywhere on the East Coast route. You can't even travel between London and Stevenage for anywhere near £7.65 never mind London to Aberdeen (cheapest London-Stevenage fare is £11). For us to get our message loud and clear across to Virgin Trains East Coast that Nectar is not acceptable we need your help. Please resist the temptation to add a Nectar card to your profile as it's 'better than nothing', if you have already signed up for Nectar then we recommend that you remove Nectar from your profile, if you think Flying Club will be of use to you then you can sign up for that otherwise we suggest that you leave your loyalty preferences set to empty. If you do want to sign up to one or the other, then we would recommend Flying Club as its a better scheme than Nectar, and the points can be exchanged for other benefits - not just flights. Unlike East Coast Rewards Nectar doesn't officially offer free tickets instead you spend your points based on the total fare. The chart above assumes a standard class ticket costs £25 and a first class ticket costs £50. In many cases the actual cost will be higher so the costs to buy a ticket with Nectar will be even greater. FirstGroup also has points promotions throughout the year and again, unlike Virgin, they tend to apply to all rail travel. FirstGroup uses the same ticket booking system as Virgin Trains East Coast so the functionality is the same. All FirstGroup operators have a good app to use for booking tickets on your phone, again these earn points for all rail travel. There's nothing stopping you spending the Nectar points earned through FirstGroup on Virgin Trains East Coast tickets. If you'd like to sign up to TopCashback you can do even better. 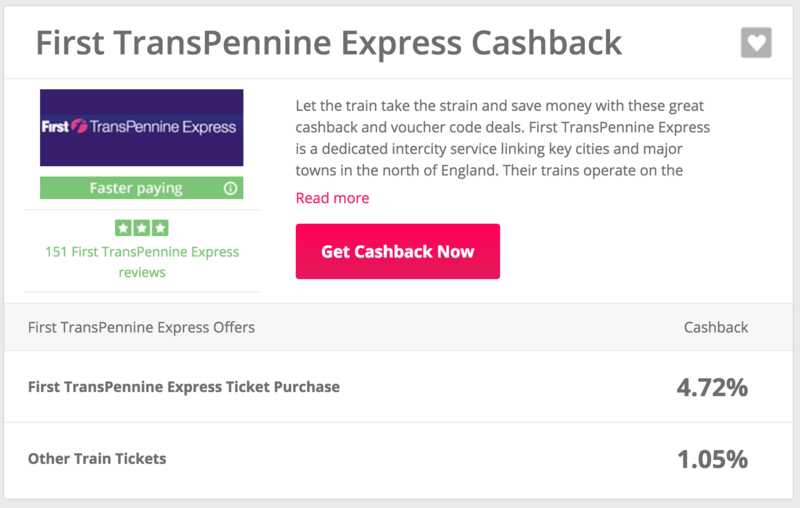 First TransPennine Express give 1.05% cashback on train journeys from other operators (so this includes Virgin Trains East Coast) this is in addition to the Nectar points you will earn. If you also travel TransPennine express they'll give 4.72% on trips that include their own services. We believe this just shows what nonsense scrapping rewards and partnering with Nectar was. If there's really many Nectar fans out there they'd already have been booking through a FirstGroup website and not virgintrainseastcoast.com. The reason East Coast Rewards was so successful was because it offered something better, it was different and made the customer feel valued.